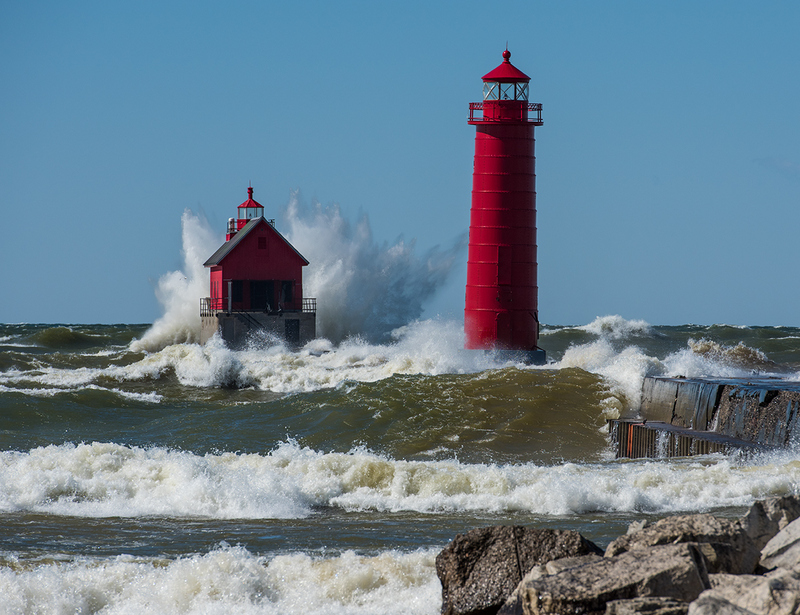 Took this during a gale at Grand Haven. The wind was gusting to over 50 mph... and the sun was out! Very unusual during Michigan winters. Thanks for the feedback, these lighthouses were painted this last fall so they are still nice and bright red, vs. orange from wear... and yes this lighthouse as are several along the lake Michigan coast, has a slight tilt to it. The lighthouse in Ludington is actually tilted 6 degrees...from erosion in the foundation. Message edited by author 2017-03-25 16:42:02. I definitely wouldn't want to be on those seas! A great shot Drake, excellent timing you can feel the fury of the wind and tide smashing onto the shore and anything in its path. There is good detail throughout. I am actually amazed at how pristine these buildings appear given the constant battering they must receive. It feels as though the lighthouse has a tilt to the right, although your horizon appears to be level, I hope that wave is the one that broke its back! Proudly hosted by Sargasso Networks. Current Server Time: 04/24/2019 12:20:21 PM EDT.